I had a meeting today in midtown about the program. As I walked toward the subway a voice called out to me. It was Juan who was part of the SSNYC program and played for SSNYC in this summer's cup. 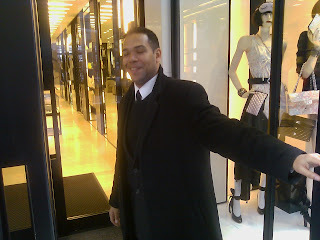 He's now head doorman at the Chanel store. I actually had no idea where that store was believe it or not (even though I knew he worked there), but now I sure do. Here's a photo I snapped of Juan on the job. Good Job Juan, you are looking good.